What are the best choices in Vinyl Windows? 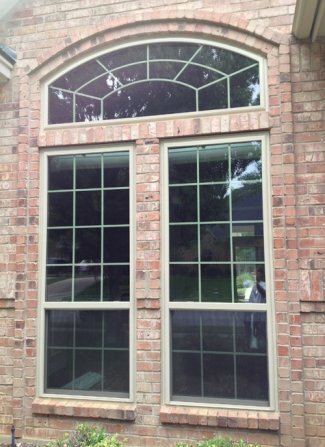 Vinyl Windows make up about 85% of the window market here in Dallas. Wood and Composite windows are expensive and aluminum no longer meets Energy Star Ratings. 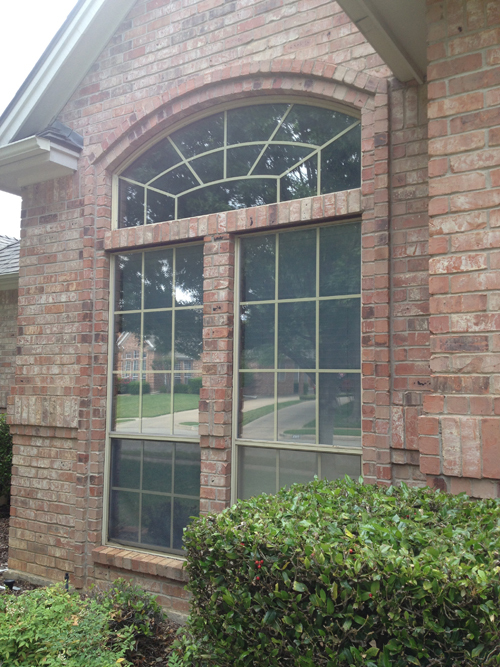 They have become the mainstay of replacement window projects in homes well into the millions. While there are cheap and expensive ones out there, there are also quality mid ranged type products that are lifetime warranty while still being affordable and providing about four times better performance than windows that are just a decade old. Heat Reflective Glass, Argon Gas, Krypton Gas and other advances have created windows that feel like walls. 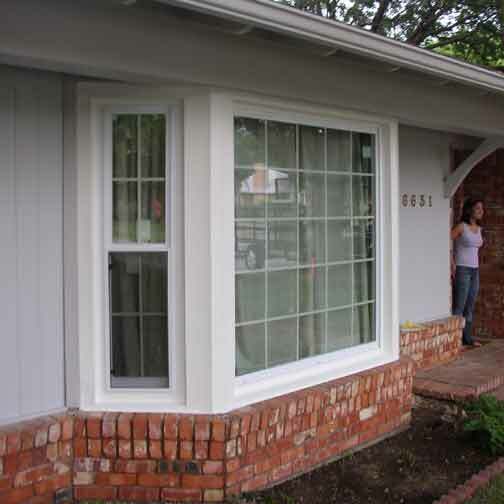 Vinyl windows as a bay window; the framing stayed in place with the vinyl windows inserted into the old wood frame. This one also has a trim packed exterior, sometimes called a full wrap. This home is on Walnut Hill Lane in Dallas and had a real noise problem. We're very happy to have noise resistant vinyl windows that really do work to lower noise inside the home. This is an industry standard from all of our fine manufacturers of vinyl windows. On this vinyl window job we covered all the wood on the exterior with vinyl coated aluminum for a no-paint necessary outside. There is no more important variable to your vinyl window replacement than is the installation itself. . These beautiful NT Vinyl Windows are triple glazed with Krypton to offer a Solar Heat Gain of .18 and a U Value to match at .18. Anything under .30 is energy star rated in vinyl windows. This option comes in the Executive or the Presidential Series. They are also now affiliated with Royal Windows and also produce Sunroom walls, patio covers and enclosures. 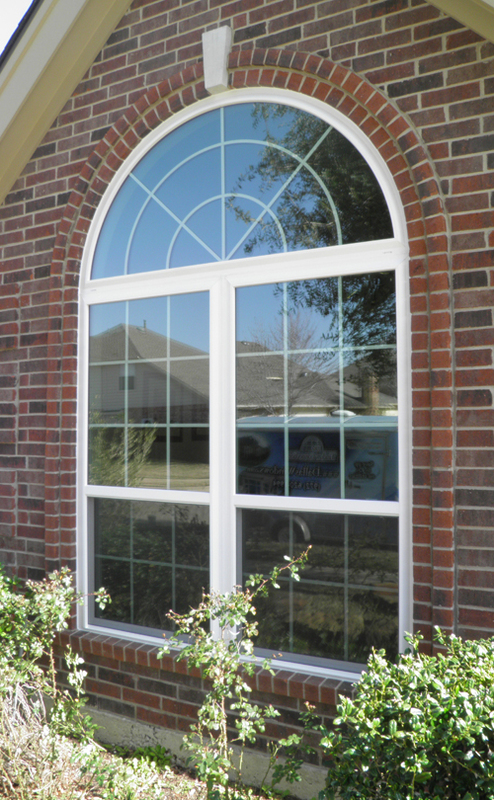 Mezzo Single hung vinyl windows have a frame of just 2 3/8". 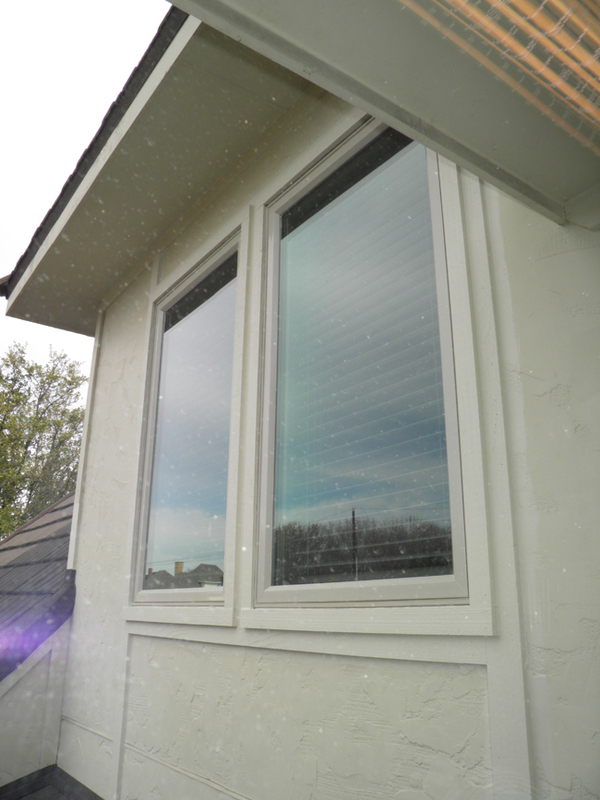 It's the lowest profile vinyl window available in Dallas in operating full framed vinyl windows. A big concern with vinyl windows is that frame thickness and how much plastic we have to look at. If you look at the reflection you'll see our Mobile Workshop which is on every jobsite to provide the best of tools and equiptment for the replacement of vinyl windows. NT Window Vinyl Windows in a Dallas home. 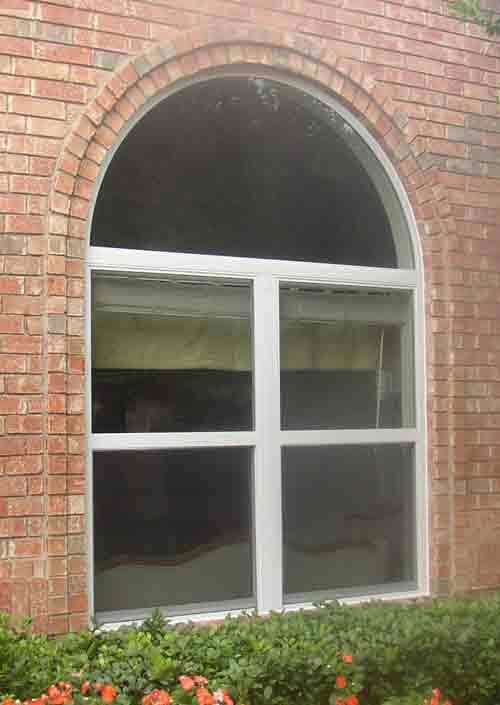 Getting the arches and circles correct in a vinyl window takes some expertese in ordering and guiding the window manufacturer. Vinyl windows are beautiful but do take some expertise. Casement Vinyl Windows provide more ventilation by opening like a door and having a screen on the inside of the vinyl window. This look will also remove all the horizontal bars from the view and provide better egress in case of fire. (Egress is the opening that someone can climb in or out of a window during an emergency.) Many older home windows are not in compliance with fire code and this window can often assist with those openings being safer for the homeowner. Don Young Company makes a thermally broken aluminum C-30 window as well as The Earthwise Vinyl Windows. Both have Low E Glass and Argon Gas filled insuled glass. Aluminum windows are no longer Energy Star Rated as of 2008. 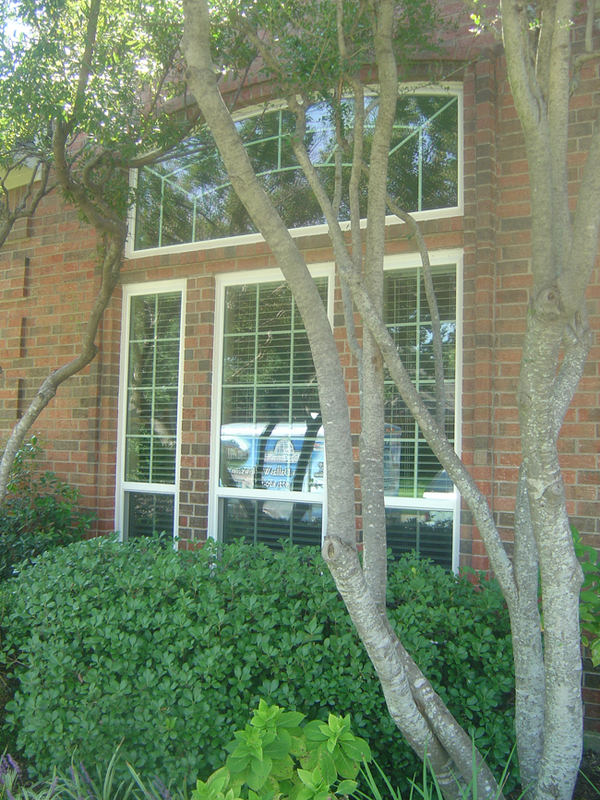 All vinyl windows will have Low E Glass in order to meet Energy Code. Better products will also have Argon Gas or Krypton Gas to enhance the energy saving aspects of the glass package. Find out more by calling us today and scheduling your free consultation. This is a fun before and after of cheap windows (builders grade) that we converted into NT Window Presidential Vinyl Windows. While the frame is a bit heavier it is better looking as it looks more like a wood window and has some substance to the frame. This is the beige vinyl window color and is used in place of white in many cases.